General Electric named Lawrence Culp its new CEO earlier this month. The company is set to report its third-quarter results later this month. All eyes are closely watching how the new management will reset the company. General Electric named Lawrence Culp its new CEO earlier this month, and investors on Robinhood, a free-trading app popular among younger traders, are piling into the stock ahead of the company’s third-quarter results. 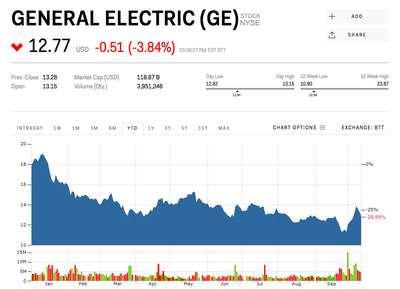 According to weekly data tracked by Business Insider, a total of 5,381 investors added GE to their portfolios this week, making it the second most-added stock after Tesla over the past week. GE is the 6th most-popular stock on the app, with more than 166,000 Robinhood investors currently holding the stock. That’s up 5% up from two weeks ago – when Culp was not yet CEO. And the confidence in Culp is not limited to Robinhood investors, with shares gaining more than 13% since Culp’s hiring was announced on October 1. And analysts up and down Wall Street have had good things to say about the hire. “We have known Mr. Culp for over 15 years and have deep respect for his leadership and relentless focus on operating excellence and accountability,” a team of RBC analysts led by Deane Dray said shortly after Culp’s hire. And on Thursday, UBS analyst Steven Winoker said, “We have every confidence that CEO Larry Culp is the leader for the job, but we want to be realistic too about the effort and timeframe.” Winoker has a “neutral” rating and $US13 price target, close to its current price. Culp has been tasked with turning around the struggling company. In its second-quarter earnings report, the company said profit from its power business dropped 58%, but it was able to match expectations with solid earnings growth in its aviation and healthcare businesses. At the time, then CEO John Flannery said he expected the power business to “remain weak through 2020,” and that the company would miss its fiscal year earnings guidance. Alongside Culp’s appointment, GE also announced it would take a $US23 billion goodwill charge for its power business, and said free cash flow and earnings estimates for fiscal-year 2018 will likely miss their targets. GE is expected to earn an adjusted $US0.21 a share on revenue of $US30.13 billion when it reports its quarterly results on October 25. Shares are down 29% this year.